At this point, we assume you’ve reached a settlement agreement with the adjuster. Now all you have to do is get your check. Hopefully, it will be smooth sailing from here, but there are a few potential issues you should know about. Before you can get your settlement check, you’ll have to fill out a few forms, including the release. These are fairly standard, but should be looked at very carefully. You don’t want to sign anything that can come back to hurt you in the future. Going forward, one of your main concerns will be figuring out how much of the settlement you’ll be able to keep. Chances are, you’re not the only one who deserves compensation. If you didn’t pay for your own medical treatment, you may be required to pay back the health care provider who did. After that, especially on larger settlements, you may have to pay taxes on a portion of the money. After reaching a verbal agreement with the adjuster, you’ll have to sign the release before you can cash the settlement check. 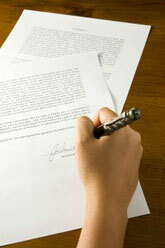 This section reviews the confirmation letter and shows you what to expect from the release form. The settlement check should be in your hands within 10 business days of coming to an agreeement with the adjuster and signing the release. If it doesn’t arrive on time, there are steps you can take to ensure your settlement isn’t falling through the cracks. If your medical bills were covered by Medicaid, Medicare, Veterans Administration, workers’ compensation, or your own health or auto insurance, you may have to pay back the costs of treatment. Learn how to identify and deal with liens here. There are a few things you should know about repaying liens placed by health care providers on your settlement proceeds. If you negotiate well, you may only have to repay a portion of the original amount. Do You Have to Pay Taxes on Your Settlement Proceeds? You might have to pay some taxes on your injury settlement. Fortunately, only certain portions of your compensation are taxable. This section looks at the specifics of taxable and non-taxable settlement income.